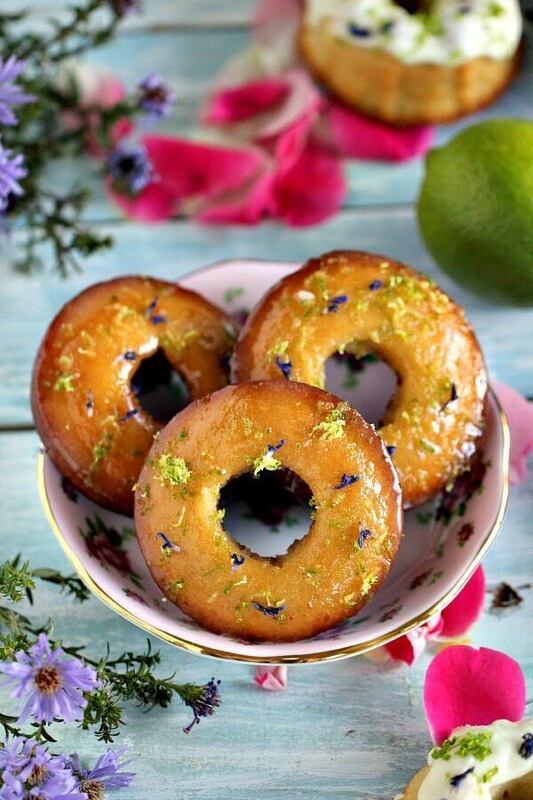 These Lemon Lime Mini Bundt Cakes are very aromatic, soft, moist and dense. The secret to that unbelievable texture is seltzer water. If you have never used seltzer water in baking you are missing out! Me and my husband are huge seltzer water fans. We always have some on hand, and you would be amazed how many great recipes you can make with it. Seltzer water is like that magic ingredient that can make your pancakes fluffier and your cakes moist, with a beautiful crumb, that is soft and stays like that for a few days. I went for a refreshing and bright lime flavor combined with a drizzle of white chocolate. 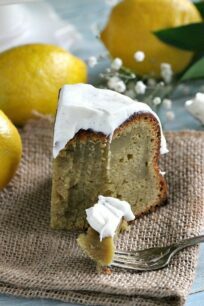 The cakes turned out very flavorful, the lemon lime flavor definitely shines and its the star of the show. I used the regular lime or lemon seltzer, and also I added lemon zest to the cake batter and lime zest as garnish. 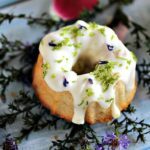 Drizzled with white chocolate and sprinkled with edible flowers these Lemon Lime Mini Bundt Cakes turned out fantastic and a show stopper. Firstly, they are festive and colorful and perfect for birthday party. In addition, they are very easy to make, and under one hour. Also, they are delicious, tender and flavorul. Perfect project to do with the kids, because it’s simple to make. Can be made 1-2 days in advance, so you don’t have to worry about last minute cooking. Can you freeze Lemon Lime Mini Bundt Cakes? Yes, you can! Cool the cakes completely and do not frost. Wrap tightly each cake in freezer wrap and add them in batches to freezer bags. They can be stored frozen for up to 3 months. In a medium bowl mix the dry ingredients: flour, baking soda, baking powder and salt. Set aside. In another bowl whisk together the seltzer water and mascarpone cheese until combined, and no clumps are seen. In the bowl of an electric mixer whisk together eggs and sugar until pale. Add the melted 1/2 cup of butter and whisk until combined. Add the mascarpone mixture and mix until the batter is just combined. Make sure you stop and scrape the sides of the mixing bowl with a spatula as needed during this process. Add the flour mixture whisk just until combined. Make sure you stop and scrape the sides of the mixing bowl with a spatula as needed during this process. Butter a mini silicone bundt cake pan and a donut pan. Pour the batter into the molds and bake the donuts for 20 minutes and the mini bundt cakes for 25 minutes. Or just until they start to turn golden brown on the edges. A toothpick inserted into the cakes comes out clean. Remove donuts and cakes from the oven and let the donuts cool into the pan for 3-5 minutes, after that transfer to a cooling rack. Remove the cakes from the silicone molds after 10 minutes and place on a cooling rack. Let cakes cool completely before drizzling with white chocolate. Bring a medium saucepan half filled with water to a boil. Place white chocolate in a medium bowl set over the saucepan of simmering water, let it melt, stirring just a few times. Make sure the bowl doesn't touch the boiling water, to avoid overheating. 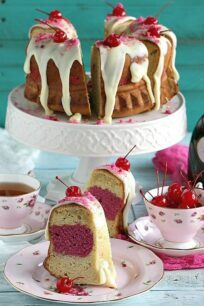 Remove bowl from heat and using a spoon pour the white chocolate over the mini bundt cakes. 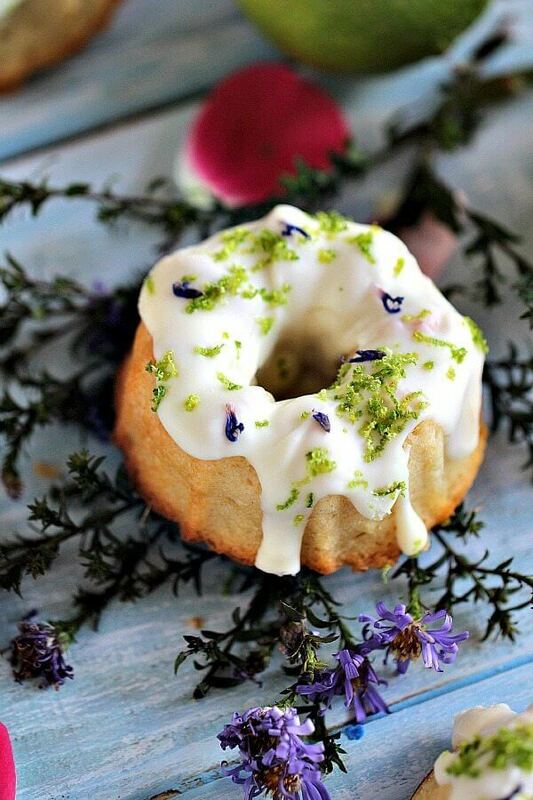 Sprinkle with lime zest and edible flowers. Let stand for 15-20 minutes before serving for the chocolate to settle, or better place cakes into the fridge for the chocolate to harden quicker. In a small saucepan over medium-low heat, whisk together sugar and milk. Glaze should be heated through, but doesn't need to come to a boil. 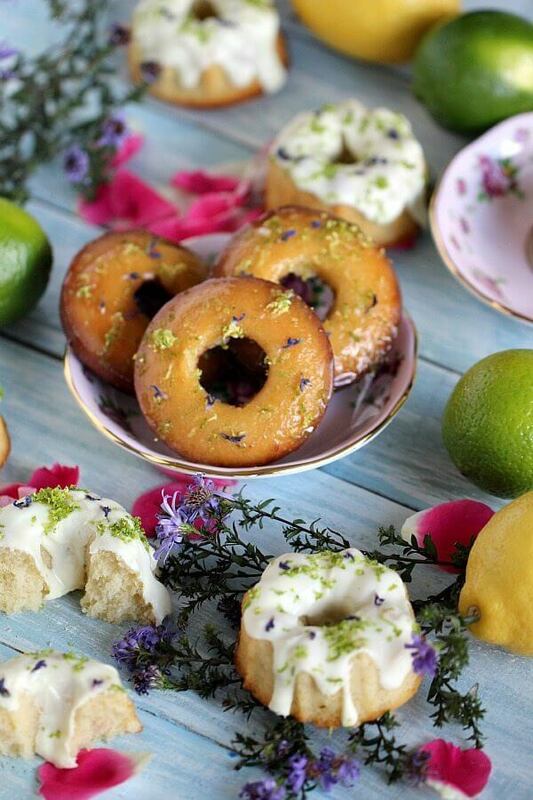 Remove glaze from heat and start dipping the doughnuts, place them on a wire rack and immediately garnish with lime zest and edible flowers. Oh wow! 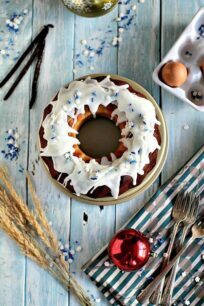 These mini bundt cake look droolicious, Katalina. And sticky donut glaze sounds super yum! Thanks Abida! I love small desserts too!